The independent oil company is riding high after announcing a massive oil discovery. 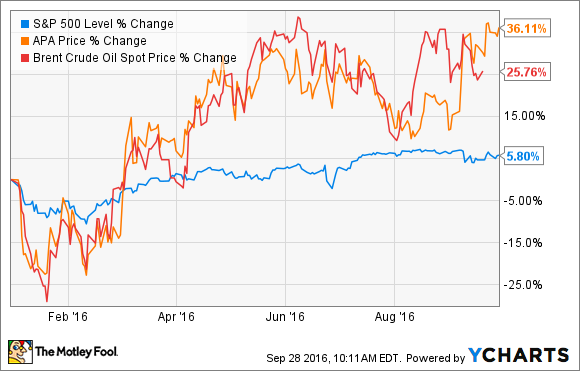 While the rising price of oil is a significant contributor to Apache's strong year, it is not the company's biggest win thus far. That honor goes to the company's recent announcement that it discovered the Alpine High oil play in a sleepy corner of southwest Texas. In early September Apache made a stunning announcement. After drilling 19 exploratory wells in the southern portion of the Delaware Basin, the company could confirm that it was sitting on a significant discovery. It estimated that 3 billion barrels of oil and 75 trillion cubic feet of natural gas were in just two of the rock formations underneath this part of Texas, with three more formations showing hydrocarbon potential. Best of all, the company was able to lock up the drilling rights to most of this discovery at an amazingly low cost. It only paid an average of $1,300 per acre to secure 307,000 net acres, or roughly $400 million, which is a fraction of the more than $25,000 an acre its rivals are paying for land in the region these days. For perspective, smaller rival PDC Energy (NASDAQ:PDCE) paid a stunning $1.5 billion for 57,000 net acres in the southern Delaware Basin last month, or $26,500 an acre. That is worth noting because 41,000 of the acres PDC Energy acquired are in Reeves County, Texas, which is the same county where Apache found Alpine High. While PDC Energy paid a premium because this acreage is already highly productive as well as highly prospective for additional drilling, it shows just how cheaply Apache acquired its land. What does the future hold for Apache and Alpine High? There is a reason why Apache did not pay all that much to lease land in the region. The industry had largely avoided the area because they thought it was gassier and had a lot of clay, which would lead to weaker margins or poor production rates resulting in less profitable wells. Additionally, according to a report by IHS Market, "Historically, well results near the recently announced Apache discovery [have] underperformed." That has analysts skeptical that Apache is sitting on a game-changing play. That said, it is hard to argue with Apache's results, which were highly successful. Furthermore, because of the widespread nature of its tests, Apache believes its initial results are highly repeatable, which gives it the confidence that future wells can deliver at least a 30% before-tax rate of return at $40 oil and $2.50 gas under its lowest assumption. However, its biggest problem at the moment is that there isn't enough infrastructure in the region to allow the company to develop the play. Because of that, Apache plans to spend the next year or so testing other oil bearing zones as well as defining the extent of the play while it builds the necessary infrastructure to turn toward full field development by 2018. The company currently estimates that it can drill between 2,000 to 3,000 future wells in the region, which represents a huge growth driver for Apache given that its current focus areas in the Permian only contain a few hundred future well locations that are profitable to drill at current prices. Apache spent more than two years putting together the Alpine High discovery. Those efforts are paying off in a big way this year, with the company announcing a significant discovery that cost it a fraction of what peers are paying for drillable land in the region. It sets the company up to deliver robust growth and returns for years to come, assuming everything goes according to plan.